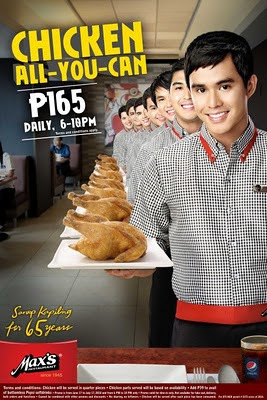 Max's Restaurant is offering a Chicken-All-You-Can promo for only Php165!!! Available in all branches DAILY, from 6pm to 10pm. Chicken only, no rice! But if you add P39 pesos, you'll get a bottomless Pepsi to help you chow down those yummy chicken parts! 1. Chicken will be served in quarters. SO NO 12 WHOLE CHICKENS ON YOU AND YOUR DATE'S TABLE, UHMKAY? 5. Additional chicken will only be served when the chicken on your plate is already consumed, i.e. FINISH YOUR FOOD FIRST. For a list of Max's Restaurant Branches, click here. Promo period is from June 17 to July 17, 2010. Happy 65th birthday Max's Restaurant!!!! For more promo updates, subscribe to my feeds here.